In my first post on Despair – and its Antidote, I covered one aspect of responding to despair. There is another way of looking at the world – two ways, perhaps, which sort of overlap depending on which side of the matter one stands on. Firstly, there is one which, for lack of a better way to put it, I’ll call “biological and evolutionary”. This perspective involves stepping back and viewing the entire history of our planet. We are but one dominant species in the history of our world. There have been others that have come and gone before us and there have been previous mass extinctions for one or other reason. Many a colony of creature or plant has seen to its own eventual demise by destroying and overcoming its environment and resources. Perhaps we are no different and can’t help ourselves. It’s a sad indictment when we have the capacity to see what we are doing but can’t change the course of our actions, but if that is the way it is, then so be it. Our planet will eventually die anyway, as will our sun. 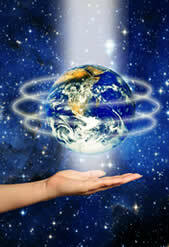 it is the nature of the universe to evolve and devolve – a rise and fall of expressions of energy and life. Secondly, there is the perspective of many who believe in reincarnation and take on board what is said by those who seem to have had previous life experiences and times in between. I have found Dr Brian Weiss very convincing in this regard, coming as he did from the perspective of a sceptic. From this viewpoint we are experiencing life here to learn lessons. The circumstances we create – both negative and positive – aid us in learning to transcend ourselves and our situations. Many who subscribe to this outlook also believe that we have imagined our world into existence and when we learn to imagine something better we will have that. My own personal response to despair over the destruction of our beloved Earth is somewhere in between these options, and what I wrote in the first part. I am wary of viewpoints that suggest that it’s ok to sit back and do nothing. That is not my mandate for this life. I am too much of a fighter and defender for that. However, I do find it immensely helpful lean on the idea that there is something bigger than our immediate experience and environment. Somewhere in this universe ,or multiverse, there may be planets where the inhabitants are getting the balance right and are learning to maintain the dream of living gently and kindly, in harmony with the environment and other living things. Perhaps in my next life I’ll be there, or perhaps I’ll be taking what I’ve learnt in this life to head off a similar disaster elsewhere. what I do know, is that I have this life, and as far as I am able I will continue to believe in the possibility of a better way of doing things and I will fight for that. ~ by Dragonwyst on January 15, 2013.